The planner has just been rolled out to testers for the first time. It is quite experimental, and many features still need to be implemented. However, we couldn’t wait to give you an early version of this unique new feature . Please send feedback and suggestions for new features to info@timescapers.com. Based on your tasks and calendars, the TimeRank Planner is able to calculate a good work schedule, acting as a suggestion as to when to do which tasks. At the moment, it takes into account task deadlines and is also able to schedule overdue tasks. However, the TimeRank Planner analysis kernel can do much more, for example also taking into account task importance and depencies. This will soon be implemented in the interface. Besides the scheduling functionality, the Planner is a useful view of your task deadlines in the context of your of your Google Calendars. A calculated plan can also be saved back into a special Google Calendar, so that you can access this on all your other devices. 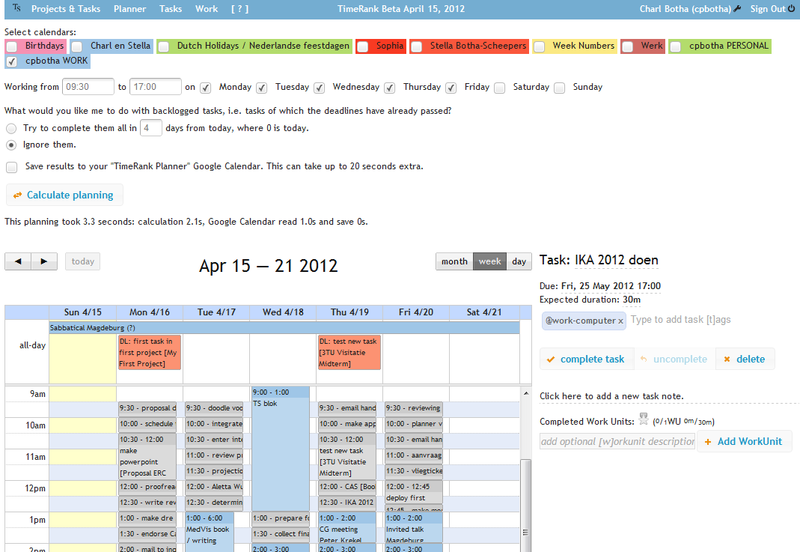 The TimeRank Planner screen showing the connected Google Calendars and a successful planning. The red blocks represent upcoming task deadlines, gray blocks are the suggested task time-blocks, and blue are appointments from one of my calendars. Clicking on a calendar block opens a new Google Calendar window with the relevant event details, whilst clicking on a gray scheduled block starts up the task editing interface on the right.